A Thing for Roses: An Enormous Thank You! Yesterday I was having trouble getting motivated. Must have been the big breakfast. So, I just puttered around from one thing to the next. Not really getting anything major done. I did however finish one project. Remember this? 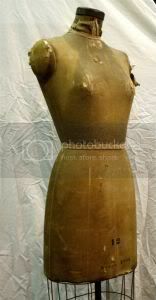 First gave it a good sanding, then I primed it and painted it with aqua spray paint (thanks Joy). 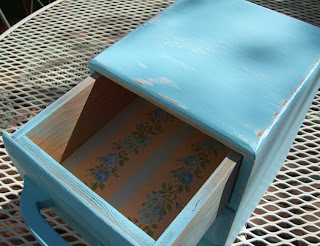 After it was completely dry I sanded it again and added the vintage rose wallpaper I got at the Coburg Antique fair to line the drawers. It goes perfectly with the paint color. I think it turned out pretty cute. It is a nice size to store little bits of stuff. Jewelry, buttons or other craft supplies. 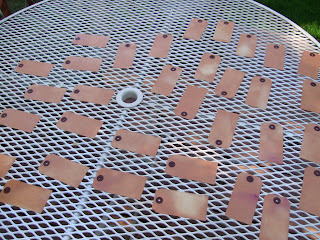 I also followed directions provided by Fresh Vintage to make these tea dyed tags. They turned out okay. Next time I will use a bigger container so the color is more uniform. I can't wait to embellish these to make some cute Christmas tags. But the best part of the day for me was receiving this in the mail. These are the goodies I won from Becky's recent giveaway! I wish my picture was better, but you get the general idea. She even threw in some "extras." 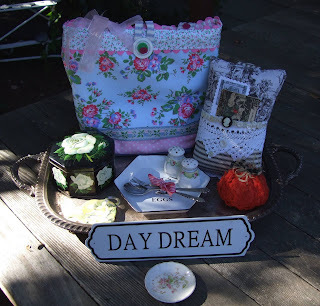 I just love it all, especially the tote handmade by Becky herself out of some adorable Cath Kidston fabric, rose ticking, pink rick rack (my favorite) and the most adorable buttons. It is just perfect! So thank you so much Becky! I feel like the luckiest girl in Blogland. You are too generous! Now I'm looking forward to doing a giveaway too. 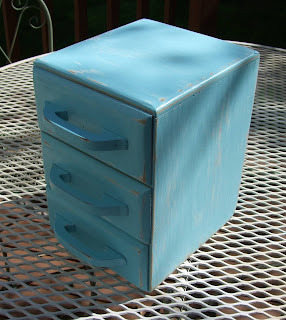 I love how the little cabinet/drawers look...the aqua and wallpaper really glam it up! You are so very welcome! 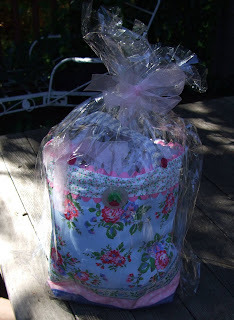 I hope you will enjoy the tote and the other tid bits! Ironically enough, the blue ticking matches your new shoes. Enjoy! I really loved the tags. Will try to do them too LOL. And the gift was great. I can understand you were happy about that one. Have a great weekend. 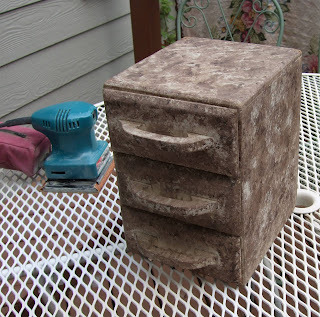 I cannot believe how you improved that little drawer unit! WOW. I am impressed. The little cabinet turned out great! Love the wallpaper lining! I'm glad you stained the tags. I haven't got around to doing it yet. Your cabinet looks great and bet you were SO excited to get your winnings! Lucky you! I like the tags that way, with the variations. And what a generous giveaway you won!!! I'm so glad you made the tags! I can't wait to see the finished product!